Childhood Fears Research Papers discuss what children fear most when they are little and also goes into their fears as they become older. This is a topic suggestion on Childhood Fears from Paper Masters. Use this topic or order a custom research paper, written exactly how you need it to be. It is not uncommon for a child to have fears of one kind or another. In fact, it is considered a natural part of human development. Fear in children can be beneficial. It is the expression of a healthy sense of caution toward those things that they perceive to be dangerous. It is a natural defense mechanism. A child under one year may cry in fear when they encounter the face of someone they are not familiar with. Toddlers are frequently afraid of the bath, being separated from their parent or loud noises. 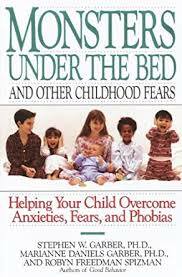 School age children may be afraid of the dark, strangers, or “monsters” under the bed. As children grow older new fears may appear such as being embarrassed at school or of being bullied by another student. Older children who watch television and the news may develop a fear of terrorism, robbery, kidnapping or murder. Usually, children who experience normal fears have few symptoms. They may talk about their fear and express concern but do not become overwhelmed by their emotions. A child having difficulty handling fear may exhibit a number of symptoms. They may become sad, irritable, angry, or have an intense need to be close to their parent. They may also have difficulty concentrating, experience changes in eating habits, or suffer physical ailments such as headaches or stomachaches. Fear may also cause changes in sleep habits. Night terrors and nightmares are not uncommon. In order to understand the differences between what is considered normal and abnormal development in toddlers, parameters must be established to differentiate between the two. A stated by Kauffman, “a wide range of behavior is considered normal.” It seems that with toddlers, the difference between normal and abnormal behavior is one of degree rather than kind. Normal children do everything that disturbed children do. Differences arise in the conditions under which certain behaviors occur and at what rates they occur. For example, crying, throwing temper tantrums, fighting, whining, spitting, and urinating are all behaviors which are present in normal and abnormal children. “Only the situations in which disturbed children perform these acts or the intensity and the rate at which they do set them apart from normal children”. A tendency to develop physical symptoms, pains or fears associated with personal problems. In general, it is believed that these characteristics are the defining measure in which to determine the presence of abnormal cognitive development in childhood. To substantiate the importance of cognitive development, many researchers have developed cognitive models which stress the importance of cognitive development in toddlers. Lewis and Brooks-Gunn and Piaget have both developed sequences of cognitive learning in which the toddler develops an acute sense of self-esteem and self-awareness around the age of 18 to 24 months. When this does not occur or is impeded by environmental forces, toddlers at this age can develop mental health abnormalities that can last a lifetime. One of the most prominent conditions to arise from abnormal cognitive development is childhood depression. As noted by Trad, “recent research suggests that depression in childhood is a real and wide spread phenomena and the risk factors for depression (lack of parental and social support) are growing in or society.” Depression is a product of adverse effects from the environment impinging on a vulnerable self, or in children a developing self. Toddlers in the state of developing self are most a risk for depression because its causes cannot be controlled. In addition, childhood depression is of great concern to psychologists because it effects can last a lifetime. There are times when a child’s fear should not be regarded as just a phase or stage they are going through. If a child develops an unexpected fear of an adult they previously trusted for example, it may signal that the child has been harmed or abused in some way. A parent must be alert and considerate of any extreme changes in their child’s behavior associated with fear. If a child’s fear consistently disrupts his sleep, prevents him from making friends, persistently disrupts family activities or generates compulsive behaviors, it is time for a parent to seek help from a professional. Every child has a legitimate narcissistic need to be noticed, understood, taken seriously and respected by his mother. A child needs to be accepted, fully, for his/her self, understood and supported in his chosen endeavors, even when the things he/she wants to do seem too silly, or too loud, or any other extreme, for the adult world. Children need to be spontaneous; they need to chase their momentary dreams. Children need continuity in their relationships with their parents, need to know that they are important people in their family all of the time. If children display natural, instinctual behavior which seems at odds with what adults find to be the accepted norm, inquiry and support are necessary, not shocked reactions. Children need to be able to explore their inner self, and develop those capacities, abilities and emotions which are true to their identity, and not be alienated from their true self. Parents need to accept their children as unique and separate beings, and not project their own expectations, fears and plans onto their child. Children need to have “automatic, natural contact with his own emotions and wishes”. Children should be able to experience and express emotional impulses and to work towards autonomy without the need to fill unreasonable expectations, such as always pleasing others. Children need to be able to express feelings, including fear, without being laughed at or humiliated. Most childhood fears are not a reason for concern. In the long run, these fears are conquered or brought under control. As children mature they are better able to comprehend the difference between reality and imagination as well as the degree of danger associated to the object they fear. Their cumulative life experience allows them to discover ways to control the things they fear. However, if children’s fears are not managed correctly they can become extreme and cause problems later in life. An American Childhood - Childhood Fears Research Papers discuss what children fear most when they are little and also goes into their fears as they become older. Self-Esteem - It is critical for the child to learn good self-esteem by discussing what children fear most. Types of Phobias - Fear can be one of the most powerful and devastating human emotions. Phobias are describes as irrational fears that can be quite crippling for the individual. Paper Masters writes custom research papers on Childhood Fears and discuss what children fear most when they are little and also goes into their fears as they become older.